The report exposes the key players involved – their targets and tactics – and examines the activities of the main shale gas lobby groups and individual companies involved. 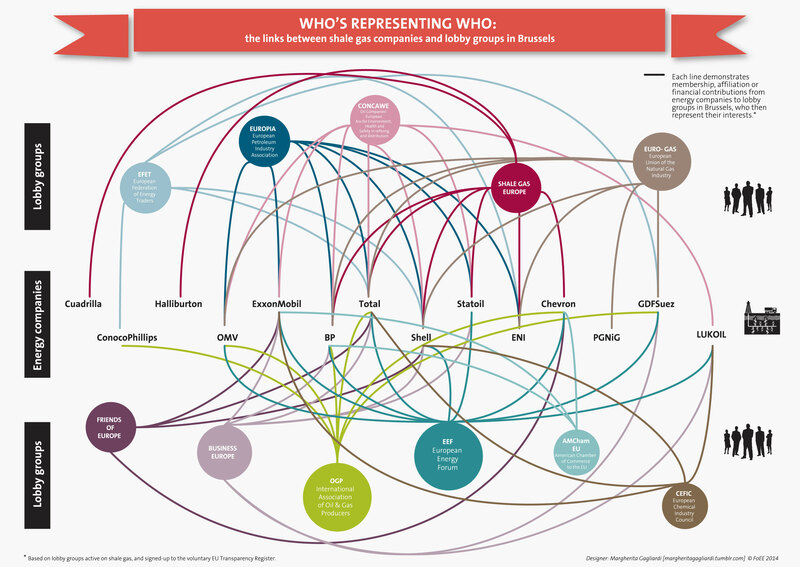 It reveals a web of lobbying activity, incorporating industry players from both sides of the Atlantic. 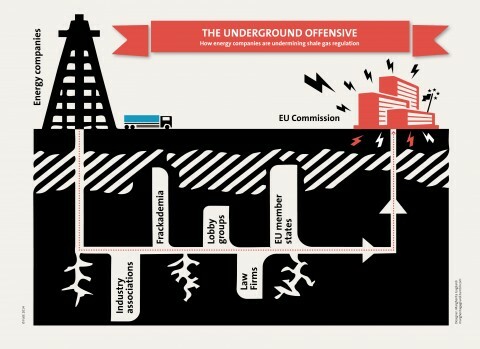 FoEE Press Release, 24 July 2014: Oil companies and lobby groups in their pay have been engaged in an underground offensive in Brussels to prevent stricter safety regulations for shale gas, according to a new report released today. 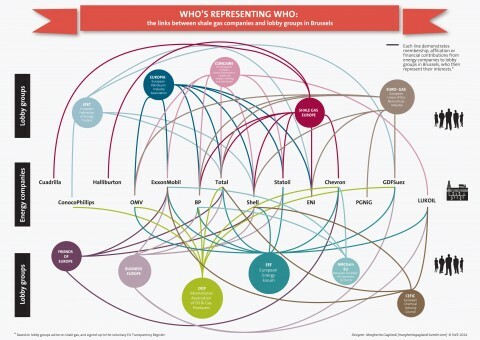 The report, ‘Fracking Brussels’, exposes the key players – including Shell, Total and ExxonMobil, and well-known lobby groups BusinessEurope and OGP – and reveals a thick web of lobbying activity. Industry associations, PR agencies, law firms, paid-for scientific reports, and even MEPs, national governments and Barroso himself have been used to promote the interests of the shale gas industry and undermine credible opposition to shale gas expansion, despite the huge uncertainty surrounding its economic viability. The extraction of unconventional gas and oil poses a significant threat to the climate, the environment and to local communities, and is being met by Europe-wide opposition from citizens. Yet this opposition is not fairly represented in Brussels according to the report: according to information obtained through access-to-document requests, EU decision-makers have had ten times as many meetings with the fracking industry compared to organisations representing citizens’ interests. The report also highlights shale gas lobby greenwash, exposing the contrast between the public statements of lobby groups, such as BusinessEurope and OGP, and behind-the-scenes lobbying strategies. In public these lobbyists back environmental safeguards; behind the scenes they lobby to weaken them, according to the report. In addition, a culture of industry-sponsored ‘frackademia’ has sprung up, with studies into the potential safety of fracking funded by shale gas companies, or authored by academics who are professionally associated with these companies. For now, EU-level regulation of the shale gas industry has been effectively sidelined. Friends of the Earth Europe calls for stronger lobbying transparency across the European institutions so that the concerns of citizens are heard in Brussels, and calls on the European Commission to re-consider and re-open the debate on shale gas regulation. Unconventional fossil fuels, like shale gas, will lock Europe into fossil fuel use, jeopardise emissions reductions and prevent investments in genuine solutions to climate change like the development of community renewable energy resources, and energy savings projects.